So, you're planning to visit Japan and want to come home with a pile of Japanese games. 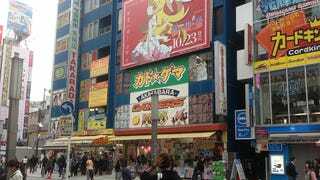 There's only one place to go, the cultural hub of otaku everywhere, Tokyo's Akihabara. But there are hundreds of stores in Akihabara, so where exactly should you go to find the cheapest prices or the rarest finds? Book Off is a chain of stores that buy and sell used books. Many of the stores, however, resell movies and games as well. Underneath the station and off the main drag is Akihabara’s Book Off, with its entire first floor committed to used games of all gaming generations back to the Famicom. The prices here tend to fluctuate. Sometimes they are lower than the other game stores in the area, sometimes higher. The only way to know for sure is to compare prices the day of. There are nearly a dozen Sofmap stores in Akihabara and more than one of them sell video games. However, only one of them—the one of them next to the giant Sega arcade near the station—sells used video games. In this building, the first and second floors are new games for various systems; but if you take the side escalator and then climb the stairs to the third floor, you’ll be in a room filled with used games and consoles from the original PlayStation to the present. This is also one of the rare stores where you can occasionally find games sold outside of their original mint condition cases. If you are buying to play instead of collect, you’ll never find a cheaper price than one of these boxless games. One block beyond the main drag and across from a KFC, you’ll find Trader. This branch of the store is filled with used games from this current generation and the last. Its prices are usually quite cheap and there’s occasionally a chance of grabbing a rare find out of one of its display cases. Super Potato is probably the most famous game store in Akihabara as far as retro gaming goes, with its arcade on the top floor and a life-size Naked Snake statue. Formerly, it even had a throne made of old Famicom cartridges (though it seems to have disappeared since my last visit). A block off the main street and near the KFC-adjacent Traders, this store takes up several floors—though not the first one; so keep a look out for its stairwell entrance. Here you are likely to find any possible retro game you are looking for. However, that doesn’t mean it’ll be cheap. Fame and excellent selection make Super Potato one of the most expensive gaming shops in the area. The towering Mandarake monolith is home to far more than gaming as they buy any and all things otaku. However, they do have a huge floor (the sixth) where the walls are lined with glass cases, filled with only the rarest of the rare of Japanese gaming—not to mention the most expensive. The floor’s other gaming contents, while much less rare, are no less expensive. However, their catalog is quite extensive and covers all gaming generations. So if there is a game you just have to pick up while in Japan and price isn’t an obstacle, the chances are high you will find what you are looking for here. Another branch of Trader in Akihabara (there are three in total) is far down the main drag, almost at its end. The first floor of the store is devoted to modern gaming (with prices identical to the other location) but the second floor in the building is dedicated to retro (and import) gaming. It is filled with games ranging from the original Famicom to the PS2 and often with reasonable prices.